PortraitsPortraits of our dogs, either in full coat or not. Other PetsHere is where the cat/guinea pig/gerbil/hamster/whatever pics go. Other DogsIf there's a dog but no sheepdog in the picture, it goes here. Grooming and Show QualityIf you're showing how to groom, or if it's a show dog pic, here's the spot! 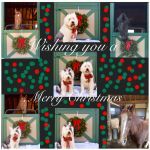 Dog Shows and Show Quality Grooming!